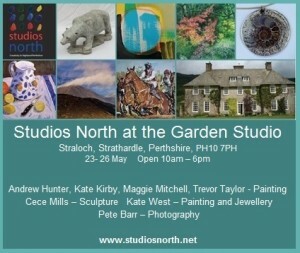 I am exhibiting as part of Studios North at Straloch Garden Studio in Strathardle , 7 miles from Pitlochry , 23 – 26 May open from 10 – 6 daily. I am exhibiting at the gallery in The Lighthouse, Mitchell Lane, Glasgow G1 3NU on the weekend of 21 – 22 December open 10 – 30 – 5 pm Saturday and 12 – 5 pm Sunday. I am exhibiting with Tickartyboo.com an exciting new venture run by two Glasgow artists Michelle & George Hunter. I am participating in a one day event at The Big Shed Christmas event on the North side of Loch Tay. Selling paintings, prints and Portable Fowl along with other artists and crafts folk from 11 – 3 pm on Saturday 14 December. The Big Shed is a contemporary building at Tombreck Farm six miles south of Killin and two miles north of Lawers village.